Just when you thought that having a chance to win a GIGABYTE G1.Sniper M3 motherboard for filling out a survey about LANcouver 2012, or getting Free BETA Keys to End of Nations courtesy of us and NVIDIA was cool, we go ahead and pull out yet another way for you to get a hold of awesome free stuff just because we love you guys so much! Today, Futurelooks and GIGABYTE have teamed up with MEGATechNews and eSports Collective Network to give away another fantastic prize to our readers, viewers, and subscribers and that prize is the G1.Killer Assassin 2 X79 E-ATX Gaming Motherboard! Put that together with INTEL's top of the line X79 chipset supporting LGA2011 socketed CPUs, and you've got one massive gaming advantage. More information about the prize can be found on GIGABYTE's Product Page. We'd like to thank GIGABYTE for providing this amazing prize to us to give away to Futurelooks, MEGATechNews and eSports Collective Network's awesome readers and viewers. How Do I Enter To Win This Gaming Awesomeness? To enter this contest, all you need to do is complete as many of the tasks as possible on the list below. This gains you valuable entries into the contest. The more tasks you complete, the more chances you have to win! In fact, some of the tasks (like the Tweeting and Sharing of this contest) can be repeated daily for additional chances to win, all the way up till contest close. Bonus Entry - Help promote LAN gaming in Western Canada by following and liking LANcouver for additional chances to win. Those tasks are also listed below. 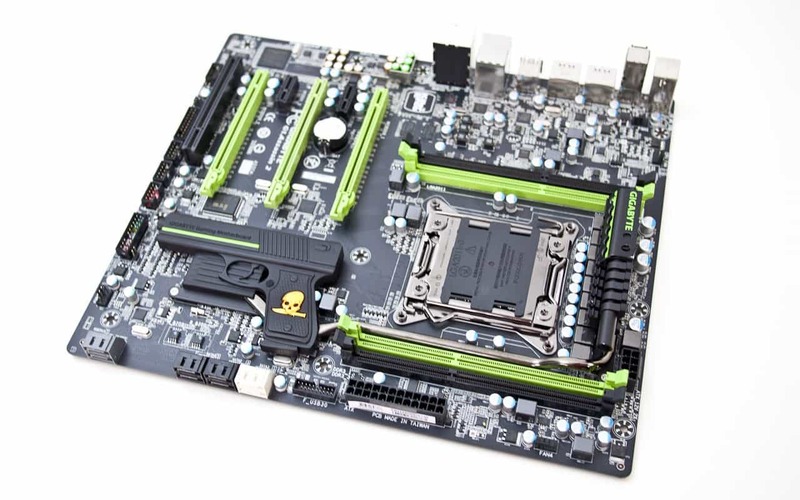 It's really up to you how nuts you want to go to win this amazing G1.Killer Assassin2 motherboard valued at $399 US. This contest is open to all residents of the United States and Canada. If you're not a resident of the United States or Canada and still wish to participate, the prize can be shipped to any US or Canadian address of your choice. Since this prize ships from Canada, this prize may be subject to brokerage and duty charges as it crosses the US border. The prize must be accepted as award and there are no substitutions. Canadians may be subject to a skill testing question because that's what Canadians have to do. There are more pictures to drool on below. Good luck! UPDATE: Congratulation to our WINNER! We ambushed him at PAX Prime 2012 this year and drew a bit of a crowd. I'm sure Jason Landals is enjoying his new board as we speak, or pondering, how he's going to afford that new Core i7 CPU for his new rig. Enjoy the video!